German pagan black metallers Nordfrost from Hochwald, Germany will release their debut full-length album “Naturgewalten” on June 2015 via Ewiges Eis Records. 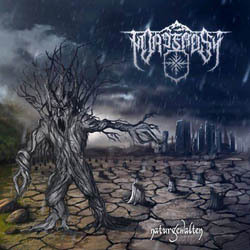 Nordfrost already convinced their fans with numerous live gigs and the split CD “Sturmboten” in 2011 in cooperation with the band Pure Scorn. They present themselves even stronger with their new album “Naturgewalten” (natural forces). Real German pagan black metal is thrashed brutally into the listeners’ heads and stays there. Kogaion Art designed the wonderful cover specifically for this release and the T-shirts. “Naturgewalten” appears in unlimited jewel-case CD edition, in a limited to 50 hand-numbered copies A5 digipak CD edition and in a limited to 100 hand-numbered copies Picture LP version. It is already available for pre-order (see details in their Facebook profile) and you can take a good taste of what’s to come just by watching the official album trailer below. The album tracklist is also revealed.